How to Fix No WiFi in Windows 10 Safe Mode? Wally’s Answer: Not being able to use WiFi can make life difficult for any modern computer user. Pretty much all laptop users and also many Windows users connect to the internet through a wireless connection these days. The user is not able to use WiFi even with Windows 10 running in Safe Mode. First of all, please try scanning your computer with Avast to scan and remove Malware from the computer. Here are a few things that you can try if WiFi is not working in Safe Mode. You will need to confirm if the wireless driver is installed and working correctly. You can do this by going to Device Manager and looking at the wireless driver. 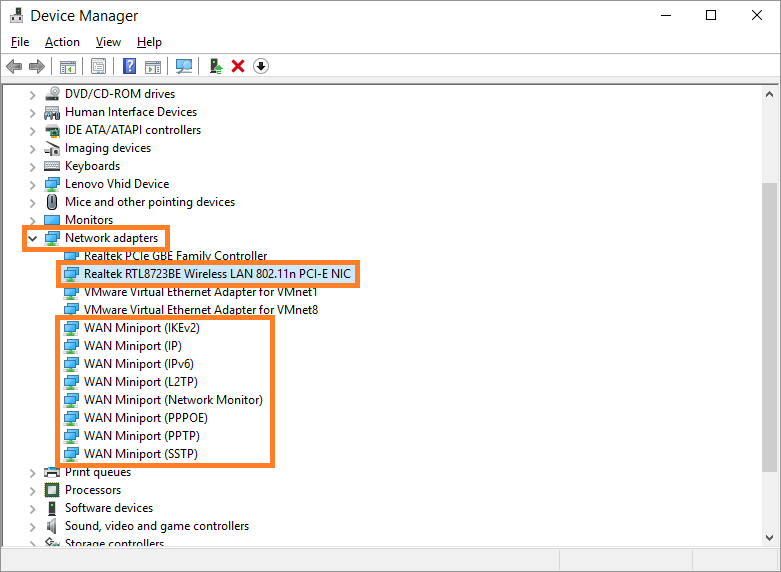 When the Device Manager opens, look under Network adapters and look for a wireless driver. The icon for the driver should look normal. It should not have a Yellow Triangle or a Red Exclamation Mark on it. You will need to Uninstall and then reinstall the wireless driver. To do this, first note the name of the driver in device manager (just in case). Right-click the Wireless driver, and then click Uninstall to remove it from Windows. Now, go to your “computer manufacturer’s website” and look for your computer’s model on it. Once you find it, look for the WiFi or Wireless driver for Windows 10 and download it. Once the driver is downloaded, run its setup and install it. Now, go to Device Manager again, do you see a mark on the drivers icon any more. Try connecting to a WiFi connection again. It should start working. If not, then please try running the DISM and SFC scans to make sure that Windows 10 is working correctly. (You will need to connect your device to the internet using a USB modem or an Ethernet cable to run the DISM command but it will also work if you have a downloaded Windows 10 ISO disk image). Are you sure that all Windows updates have been downloaded and installed on the computer? If not, then your problem might be solved by installing Windows updates. This is because that problem might have already been fixed in a Windows update. (You will need to connect your device to the internet using a USB modem or an Ethernet cable to get internet access). 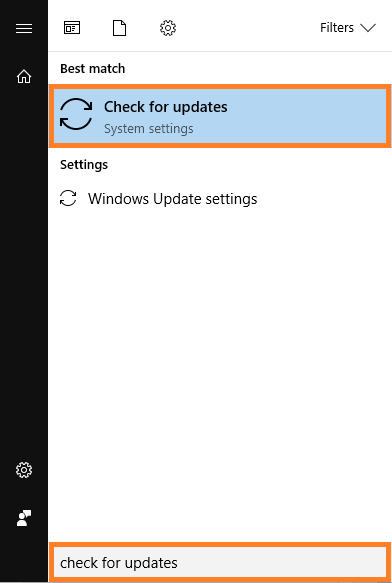 You can start Windows update by pressing the Windows Key and then typing check for updates to search for it. After that, click Check for updates from the search results to launch it. 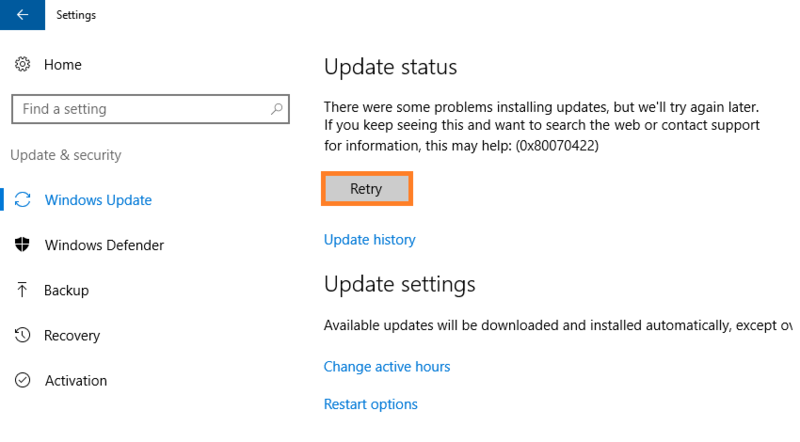 Click Retry to start looking for updates if it doesn’t start by itself. This can take a few minutes. As soon as the updates are downloaded, they should be installed automatically.